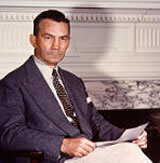 James V. Forrestal was America's first Secretary of Defense, and chief architect of the modern US Department of Defense; reliable sources state that Forrestal was one of the initial members of the newly-formed MJ-12, his position on the committee being replaced subsequent to his death by General Walter Smith. Forrestal was an idealistic and religious man who believed that the public should be told the truth about the UFO problem. When he began to talk to leaders of the opposition party and leaders of the Congress about the alien problem, he was asked to resign by President Truman. He expressed his fears to a number of people, and believed that he was being watched. This was interpreted by those who were ignorant of the facts as paranoia. Forrestal later was said to have suffered a mental breakdown and was committed, apparently against his will, to Bethesda Naval Hospital suffering from "exhaustion", where he was held under a round the clock Marine guard. Many investigators believe that it was feared that Forrestal would begin to talk again, and he had to be isolated and discredited. At around 1:45 am on May 22, 1949, some seven weeks after his admission to the hospital, Forrestal plunged from a 16th floor window of the hospital to his death. A belt or cord, said to be from his dressing gown, was tied tightly around his neck. It was also reported that his body was found wrapped in a bedsheet. Allegations have been made that agents tied a sheet around his neck, fastened the other end to a fixture in his room, and threw Forrestal out the window; the sheet tore, and he plummeted to his death. The Navy's five-month investigation concluded that Forrestal had taken his own life. The investigation report was then classified and remains so to this day. Many investigators consider Forrestal to have been one of the earliest victims of the Great UFO Cover-up which started in earnest after the Roswell crash of 1947.